Merlot is the name of a red grape which traces its ancestry to the biturica variety. This was brought to France in the first century. From this stock came many of the varieties we know today - Cabernet, Malbec, and so on. The "Merlot" grape was not named as a distinct variety until the 1800s. It is known as a Noble Bordeaux varietal. Merlot is not well suited for long aging, so until recently the wine made from merlot grapes was used solely as a blending wine. Soft and compliant, it was used to mix with Cabernet in the French Bordeaux wines. It would bring a more mellow aspect to these wines. Recently, merlot has been discovered as a delicious wine in its own right. It is being grown for that purpose primarily in California and Chile, and in a few other wine regions. It tends to be more tolerant of soil conditions than a Cabernet vine is, and while it buds earlier, it also can be harvested earlier. Not quite as harsh as other reds, merlot has less tannin than a Cabernet and can therefore be drunk earlier. It is mellow but still complex, a bit chewy. Merlot is known for the flavors of plums, black cherry, violets, and orange. It is a perfect match for beef and other medium-heavy dishes. Try some with a rich, red pasta dish, or even a heavy chicken dish. Merlot is also an excellent compliment to chocolate. Merlot should be served at 64F. Merlot vaulted to infamy with the movie Sideways. The lead character in Sideways loved pinot noir and avidly hated merlot. He even said in one scene that he would leave a restaurant if someone ordered Merlot. Sadly, Merlot sales dropped after the movie came out - but have since regained their previous levels. All Wheels ordered by noon on Thursday will be ready for shipment the following Monday. Your wheel is ordered specifically for you so you may request that it is cut into 4 quarters or 2 halves in the comments section! Mix the mild and buttery taste of Asiago cheese with bright, bold red pepper flakes to make an irresistible flavor combination. BelGioioso Peperoncino cheese adds heat and savory spice to any dish or cheese plate to satisfy a craving for a touch of extra heat. You can see flecks of red pepper in each Peperoncino cheese cube and taste the difference with a burst of spice. Order BelGioioso Peperoncino cheese cubes to add color and zest to your party cheese plate or melt cubes over quesadillas, tacos, pasta, salads or into sauces to enjoy the rich flavor or cheese with a subtle, spicy kick. Any items not included with the shipping offer will be charged accordingly. BelGioioso Pepato cheese offers the ideal blend of creamy cheese and savory spice. Add a Belgioioso Pepato cheese wedge to your cheese plate for a delicious appetizer with vegetables and crackers or add to a salad to introduce a hint of peppery spice with tangy cheese. Pepato means “with pepper” and includes small peppercorns inside the cheese to mix with the nutty, earthy flavor. Like all of Belgioioso's mouthwatering cheeses, Pepato cheese is aged to perfection. With a creamy white color mixed with black peppercorns, a BelGioioso Pepato cheese wedge makes an appetizing and attractive addition to hors d'oeuvres, salads, steamed vegetables, breadsticks, cured meats and even sandwiches. 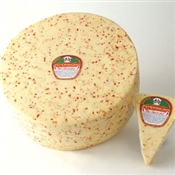 BelGioioso Pepato Cheese is a firm Asiago based cheese delicately spiced with peppercorns resulting in a sharp, piquant flavor. In Italian, Pepato means "with pepper". Whole black peppercorns are added to the curd during the cheese making process to create this delicately spiced table cheese. Made with part skim milk, Pepato is aged over 5 months and has a beautiful table presentation. Pepato was awarded 2nd place by the 2004 American Cheese Society. BelGioioso Pepato cheese offers the ideal blend of creamy cheese and savory spice. Add a Belgioioso Pepato cheese wedge to your cheese plate for a delicious appetizer with vegetables and crackers or add to a salad to introduce a hint of peppery spice with tangy cheese. 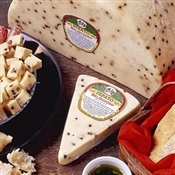 Pepato means “with pepper” and includes small peppercorns inside the cheese to mix with the nutty, earthy flavor. Like all of Belgioioso's mouthwatering cheeses, Pepato cheese is aged to perfection. With a creamy white color mixed with black peppercorns, a BelGioioso Pepato cheese wedge makes an appetizing and attractive addition to hors d'oeuvres, salads, steamed vegetables, breadsticks, cured meats and even sandwiches. Shown as a half wheel.